OXFORD, Miss. 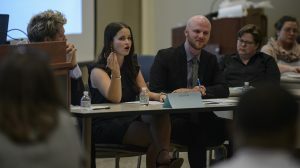 – The University of Mississippi Department of Philosophy and Religion has created new classes, and conducts an annual Ethics Bowl and a Great Debate with the goal of equipping students to respectfully grapple with some of life’s most pressing questions. Specialized ethics classes have become more common at universities around the country over the last 20 years against the backdrop of many high-profile scandals that involve unethical behavior. The department has courses on medical, environmental, professional and business ethics, among others. Deborah Mower, an associate professor of philosophy, came to UM in 2016 and specializes in moral psychology, applied ethics and public policy, and moral education. Unlike many academic subjects that deal only with professional situations, the curriculum can be applied to all aspects of life, said Mower, whose work is supported by the Mr. and Mrs. Alfred Hume Bryant Lectureship in Ethics Endowment. “Everything is an ethical issue,” Mower said. Films, books, the legal system and other aspects of our culture all have ethical theories imbued in them, so people pick up a variety of beliefs, but they can become a hodgepodge. Those beliefs don’t all fit together nicely, and in some context, one might apply one principle but ignore it in another situation. This idiosyncrasy is problematic, Mower said. The value of an ethics class is not just applying what is learned, but also figuring out how some of your beliefs fit into single coherent theories, she said. Seeing students figure this out is always rewarding, Mower said. “You always get that moment in the semester when you are teaching them some particular theory and they get this ‘aha!’ look on their face where they’ve realized, ‘I’m a Kantian and I never knew it,’ or, ‘I’m a virtue theorist and I never knew it,'” she said. Mower also praised the students on the first two UM Ethics Bowls teams, which competed in 2017 and 2018. They spent hours each week practicing, which included being questioned about specific topics by experts and applying their teachings to the answers they gave. The UM Ethics Bowl participants also held a Great Debate of 2018 earlier this semester. At the Great Debate, two groups handled the topic “Should the standard of sexual consent be an affirmative verbal ‘yes’?” One team spoke in favor of the “affirmative, verbal ‘yes'” while another spoke against it. Their presentations were followed by judges’ questions and a question-and-answer session with emphasis on how to address specific claims and arguments civilly for a productive conversation. A reception afterward allowed students to discuss the issue further with attendees. Madison Bandler, a senior biology major from Decatur, Illinois, completed a fellowship last year in which she worked at the UM Medical Center in Jackson. There, she learned about ethical issues surrounding medicine, which led her to begin taking classes under Mower. Mower urged her to become involved with the Ethics Bowl, but she wasn’t immediately on board. The team studied issues ranging from quarantines, euthanasia, a ban on Muslims and psychiatrists diagnosing someone with mental illness through television and without seeing them in a clinical setting, which is also known as “the Goldwater rule.” Exploring so many diverse topics with such great depths challenged her. The coursework and competitions will serve the aspiring physician well, she said. Ethan Davis, a senior philosophy major from Laurel, said he enjoyed the Ethics Bowl and Great Debate for one reason that might sound weird. He believes formal academic debate has grown stale, but the Ethics Bowl offers something new and different. It is designed to begin a conversation, rather than win an argument. It rewards friendliness and the ability to engage the opposing team’s viewpoint in interesting ways. Ethics Bowl teams can actually agree. “You find yourself using your response time to say things like, ‘We completely agree with your position, and here are some elements that we think are important that you didn’t get a chance to speak about. Could you elaborate on them?” Davis said. Samantha Priest, a senior philosophy and psychology major from New Albany, said the Ethics Bowl taught her the importance of listening to other people’s opinions with a charitable mind, with the goal of finding the strongest, most rational interpretation of a speaker’s argument. It also drove home the importance of knowing that she not only needs to look at an issue from all perspectives, but also to consider solutions, she said.